GST is one of the hot topics and an MBA aspirant should be able to present the facts on the same along with his/her views coherently. Experts at MBAUniverse.com bring forth key facts on this hot GD topic to help an MBA aspirant to take his/her view point while speaking in the GD round of a top MBA college. Impact of fiscal and monetary policy changes on economy is more relevant to understand whether it would bring with it a wheel of growth or could prove against the economic and business interests of the country, an MBA student is supposed to know and must be able to speak about it in the GD round after gathering thought and analyzing the pros and cons of the same. Goods and Services Tax (GST) is an indirect tax applicable throughout India which has replaced multiple cascading taxes levied by the Central and State governments. GST was introduced as The Constitution (One hundred and first Amendment) Act 2017 following the Constitution 122nd Amendment Bill. The GST is governed by a GST Council and its Chairman is the Finance Minister of India. The process of forming the legislation took 17 years. It was first proposed in the year 2000. The minimum tax rate under GST is 0% and highest tax rate is 28%. Under GST, Goods and services are taxed at the following rates: 0%, 5%, 12%, 18%, 28%. There is a special rate of 0.25% on rough precious and semi-precious stones and 3% on gold. In addition a cess of 15% or other rates on top of 28% GST applies on few items like aerated drinks, luxury cars and tobacco products. A single GST has replaced several existing taxes and levies which include: central excise duty, services tax, additional customs duty, surcharges, state-level value added tax and Octroi. Other levies which were applicable on inter-state transportation of goods have also been done away with the launch of GST regime. GST is levied on all transactions such as sale, transfer, purchase, barter, lease, or import of goods and/or services. India has adopted a dual GST model implying that taxation is administered by both the Union and State Governments. Transactions made within a single state will be levied with Central GST (CGST) by the Central Government and State GST (SGST) by the government of that state. For inter-state transactions and imported goods or services, an Integrated GST (IGST) is levied by the Central Government. GST is a consumption-based tax the impact of which will be at the destination. The taxes therefore, are paid to the state where the goods or services are consumed and not the state in which they were produced. IGST complicates tax collection for State Governments by disabling them to collect the tax owed to them directly from the Central Government. Under the previous system, a state would have to only deal with a single government in order to collect tax revenue. GST: Why Differential tax rates are applied? Lower rates for essential items and the highest for luxury and de-merits goods. Service Tax has gone up from 15% to 18%. The services are taxed at lower rates such as train tickets and will fall in the lower slabs. Essential items including food is taxed at zero rate. The propose is to control inflation as food and essential items constitute roughly half of the consumer inflation basket. The lowest rate of 5% is for common use items. There are two standard rates of 12 per cent and 18 per cent, which fall on the bulk of the goods and services. This includes fast-moving consumer goods. Highest tax slab is applicable to items which are currently taxed at 30-31% - excise duty plus VAT. Ultra luxuries, demerit and sin goods like tobacco and aerated drinks attract a cess for a period of five years on top of the 28 per cent GST. The collection from this cess as well as that of the clean energy cess would create a revenue pool which would be used for compensating states for any loss of revenue during the first 5 years of implementation of GST. The cess would be lapsable after 5 years. The structure is a compromise to accommodate demand for highest tax rate of 40% by states like Kerala. The principle for determining the rate on each item is to levy and collect the GST at the rate slab closest to the current tax incidence on it. Government has created GSTN as a non-profit organization. As per the government website on GST, "Goods and Services Tax" Network (GSTN) is a nonprofit organisation proposed to be formed for creating a website / platform for all the concerned parties related to the GST, namely stakeholders, government and taxpayers to collaborate on a single portal. When up and running, the portal is supposed to be accessible to the central government which allows it to track down every transaction on its end while taxpayers are advertised to have the ability of connecting this to their tax returns. However its efficacy and efficiency is yet to be tested. The IT network was touted to be developed by unnamed private firms. The known authorised capital of GSTN is ₹10 crore (US$1.6 million) in which Central Government holds 24.5 percent of shares while the state government holds 24.5 percent and rest with private banking firms for smooth running of the transactions. After a long nationwide debate on Goods and Service Tax (GST), the initiative was launched at midnight on June 30, 2017 in a ceremony held at Central hall of Parliament. Various provisions and benefits of GST were shared in their speeches by the Finance minister of India, Mr Arun Jaitley; the Prime Minister of India Mr Narendra Modi and the President of India Shri Pranab Mukherjee. India’s biggest tax reform was launched at midnight of June 30 at Parliament's historic Central Hall, by President Pranab Mukherjee and Prime Minister Narendra Modi. GST therefore, became effective from July 1, 2017. Current tax rates were replaced by GST rates with effect from July 1. It is the fourth time since Independence that an event was held at the Central Hall of Parliament at midnight. The last three celebrated India's Independence. Congress boycotted the GST launch along with several other opposition parties. GST replaced a slew of indirect taxes with a unified tax and was set to dramatically reshape the country's 2 trillion dollar economy. The GST fuelled inflation in the short term. The GST rate started at 5% and went upto 28%. The 18% taxation on services such as restaurants; movies increased prices. Another problem with the GST is not including liquor and petroleum under GST’s ambit. These are major revenue sources for the government. After the introduction of the GST, while costs of essential food items did not increase so much, other consumer goods and services in India including food, hotel charges, insurance and cinema tickets have become costlier. Upon its introduction in the country, GST led to a number of protests by the business community, primarily due to an increase in overall taxes and hence the prices of goods. Thousands of cinema theatres in the states where higher rate of GST was applied on movie tickets went on strike. However, with the launch of GST, the check posts across the country were abolished ensuring free and fast movement of goods. The central government has assured states of compensation for any revenue loss incurred by them from the date of GST for a period of five years. However, no concrete laws have been framed to support such action. Assume that the GST is set at 20%. Suppose that the manufacturing cost of a Product A is 100 and assuming a GST of 20% the total amount is Rs. 120. The next step of taxation would be when the Product is sold to consumers. Suppose the product is sold at a price of 150. The GST will charge another 20% on just the difference of Rs. 150 and Rs. 120 i.e. only 20% on Rs. 30 which is equal to Rs. 6. Accordingly, the final price is Rs. 150 + Rs. 6. GST will be applied at every step of value creation. The GST is estimated to provide an immediate boost of 0.9% – 1.4% of the GDP. GST is in a form of comprehensive indirect tax on manufacturing, sales and consumption of goods and services within the country. It is based on the input tax method. The tax is levied and collected at each stage of sale or purchase of goods or services. GST-registered businesses will be able to claim tax credit to the value of GST they paid on purchase of goods or services as part of their normal commercial activity. GST is a destination based tax as against the present concept of origin based tax. The tax structure is much simpler and easier to understand. According to a report by the National Council of Applied Economic Research, GST is expected to increase economic growth by between 0.9 per cent and 1.7 per cent. Taxable goods and services are not distinguished from one another and are taxed at a single rate in a supply chain till the goods or services reach the consumer. GST is said to be proving detrimental to the growth of small scale industries. Basic exemption limit in excise of Rs. 1.5 Crores taken away in GST, which affects the Small Scale Industries. Lakhs of industries in India are surviving only for one reason that they are not required to pay excise if their turnover does not exceed 1.5 crores. Services which were charged on receipt basis are charged on accrual basis. Number of goods and services have become costlier after launch of GST. It would increase inflation in the country which is already reeling under the pressure of demonetization. Barely three months after rolling out the Goods and Services Tax, Finance Minister Arun Jaitley, who heads the council, also announced businesses with a turnover of up to 1.5 crores would be allowed quarterly filing of GST Return. Small and Medium traders and exporters were hurt most by the application of GST. It was crucial to Prime Minister Narendra Modi’s plans to create millions of more jobs. Accordingly, the decisions were taken with a view to raise revenue and ease compliance. Following are the major changes in GST implementation taken to boost the growth rate of Indian economy and provide an environment for ‘Ease of doing Business’. Businesses with less than 1.5 crores annual turnover will file returns and pay taxes on a quarterly basis instead of monthly basis. Such businesses make up for nearly 90 per cent of tax assesses but contribute very little tax. 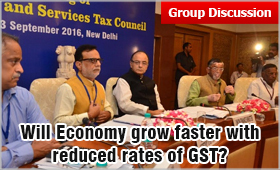 The GST council also agreed to raise the threshold for the composition scheme. This scheme allows small traders to pay a standard tax rate – from Rs. 75 lakh in turnover to Rs. 1 crore. These establishments pay standard tax rates; 1 per cent for traders, 2 per cent for manufacturers and 5 per cent for restaurants. Reverse charge mechanism suspended till March 2018. This rule shifts the liability to pay the tax on the buyer rather than the seller and the supplier has to be registered under GST to check tax evasion. The GST council agreed and advised the government to start issuing refund cheques from 10 October to exporters who had complained their working capital was locked up. By April 1, 2018, the council also targeted to have e-wallets for every exporter to credit a notional amount as an advance credit to pay taxes. The GST rates for textiles including zari, unbranded ayurvedic medicines, plastic and e-waste have been slashed by the council. The council comprises state finance ministers, officials from both states and the Centre and is headed by Union Finance Minister. The RBI governor has suggested simplifying GST to boost growth and earlier cautioned also that “teething problems” with GST had impacted the manufacturing sector. GST Council decided to defer registration of tax deduction and collection at source till March 31, 2018. Goods transporters who had threatened to go on strike, have been told services provided to unregistered entities would be exempted from GST. The Prime Minister, Mr Modi has also promised to fix problems in GST cited by businesses. (iv) to pay on demand an amount equal to the integrated tax payable on the said goods but for the exemption under this notification in the event of violation of any of the above conditions and applicable interest. Exemption from IGST on imports of medicines supplied free by international agencies like UNICEF, WHO, Red Cross etc. A. Exemption from IGST on imports of bona fide gifts upto CIF value limit of Rs. 5000 imported through post or air. GST Rates for 29 Goods and 53 Services have been reduced. These rates will come into effect from 25th January 2018. Parts and accessories for the manufacture of hearing aids. 1. Transportation of petroleum crude and petroleum products with ITC Credit. Transportation of petroleum crude and petroleum products without ITC Credit. Providing information under RTI Act, 2005 from GST. Legal services provided to Government, Local Authority, Governmental Authority and Government Entity. Pure services provided to Government entity by a Panchayat/ Municipality. Composite supply involving predominantly supply of services (i.e. up to 25% of the supply of goods) is also exempted. Renting of transport vehicles to a person providing services of transportation to an educational institution (students, faculty, and staff) providing education upto higher secondary or equivalent. Services provided by and to Fédération Internationale de Football Association (FIFA) and its subsidiaries directly or indirectly related to any of the events under FIFA U-20 World Cup in case the said event is hosted by India. After the changes in GST rates, it is expected that prices of essential items will stop increasing. The small and medium businesses which saw no growth, would be on the track again and will contribute to the economic growth of the country.